Wifi Cabs is committed to facilitate you with prompt transport services round the clock, at reasonable rates, in and around Vizag. We intend to help you traverse miles in utmost comfort behind trendy wheels. Nowadays, besides solo trips or family tours by a sedan or SUV, the growing need for a larger vehicle to accommodate more people along with their luggage, while on an escapade with friends or extended family, is quite justified. Thus, in order to enrich your group travel experiences, we have introduced 13 seater bus in Vizag. The vehicle not only assures high end comfort during long tours, but also offers promising agility unlike most maxi taxis, thus catering to your concern for time constraints. 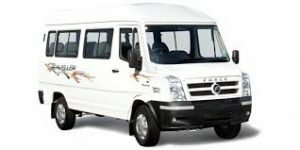 In case you are on the lookout for a bigger and better option, we provide you with 17 seater bus in Vizag with spacious legroom, reclining seats and the added delight to experience fun travel with a larger group. Come on board and feel the pleasure of togetherness!